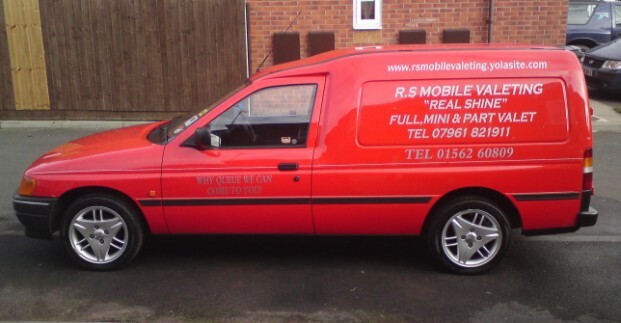 Hello and welcome to RS MOBILE VALETING SERVICE IN COVENTRY. With reputation being key to our success, we are dedicated to giving you the quality of service you would come to expect. With this in mind, we hope that you will want to use time after time. Our attention to detail and the desire for success means our clients get nothing short of 100%. Small businesses rely on repeat business, therefore its in our own interests to give our customers the very best quality of service and professional attitude possible to ensure our success. * INTERIOR & EXTERIOR VALETING. * SUPPLIES OWN WATER & POWER. * FULL, MINI & PART VALETS. * WEEKLY, MONTHLY VISITS AT WORK, HOME OR WHEREVER YOU ARE. * ALL TYPES OF VEHICLES WELCOME. * DISCOUNTS AVAILBLE TO RETURNING CUSTOMERS OR MULTI CAR BOOKINGS.